The world demand for sea food is increasing dramatically year by year, although an annual upper limit of 100 million tons is set so as not to exhaust reserves. It is for this reason that there is a considerable move towards modernizing and intensifying fish farming. To be economically viable, fish farming must be competitive, which means that feed costs amongst others must be carefully monitored as the operational cost goes 60% for feed alone .Therefore selection of cheaper and quality ingredients is of paramount importance for sustainable and economical aquaculture. Identification of suitable alternate protein sources for inclusion in fish feeds becomes imperative to counter the scarcity of fish meal. In addition to its scarcity and high cost, often fish meal is adulterated with sand, salt and other undesirable materials. All these factors have forced fish feed manufactures all over the world to look for alternate sources. In this context they have been left with no protein but to substitute animal protein with plant protein sources. A variety of plant protein sources including soybean meal, leaf protein concentrate and single cell protein have been tested. The tests have shown that these can be included as alternatives to fish meal (Ogino et al, 1978, Appler and Jauncy, 1983). Of various plant protein sources, soybean meal (SBM) is one of the most promising replacements for part or whole of fishmeal. Soybean meal is the by-product after the removal of oil from Soya beans (glycine max). At present soybean meal is the most important protein source as feed for farm animals and as partial or entire replacement of fish meal. 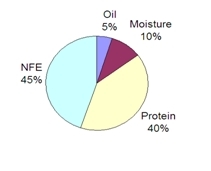 The chemical composition of soybean meal is fairly consistent (Figure 1). The crude protein level depends on the soybean meal quality. Soybean has one of the best amino acid profiles of all vegetable oil meals (Table.1).The limiting amino acids in soybean meal are methionine and cystine while arginine and phenylalanine are in good supply (New, 1987). The fat content of the solvent extracted soybean meal is insignificant but soybean expeller has oil content between 6.0 and 7.0%, while full fat soybean expeller has oil content between 18 to 20%. Soybean meal and soybean expeller are lower in macro and trace elements than fish meal. There is no substantial difference between the individual soybean meal products (Table. 2).The calcium content is low and the phosphorus level is rather higher. However, the phosphorus is bound to phytic acid and its availability for aquatic animals is, therefore, limited. Soybean meals and expellers are reasonable source of B- vitamins. For most vitamins there are insignificant differences between the different products. However the full fat soybean meal tends to be higher in some vitamins. While the products are mainly higher in choline content, the vitamin B 12 content is low and pantothenic acid is mainly damaged by heat treatment (Table-3). The digestible energy of soybean meal over all fish species ranges from 2572 to 3340 Kcal/kg (10.8 to 14.0 MJ/kg) (Table. 4). The metabolizable and digestible energy of full soybean meal increases with the increase heating temperature at a given time due to the inactivation of trypsin inhibitors. Trypsin inhibitors: - About 6.0 % of the total protein of soybeans reduces activities of trypsin and chymotrysin, which are pancreatic enzymes and involved in protein digestion (Yen et al., 1977). The activity of trypsin inhibitor is not fully understood, but is responsible for the poor performance of certain fish species (Alexis et al., 1985, Balogum and Ologhobo., 1989). Lectins: - This type of toxic protein is chemically hem agglutinin, which causes agglutination of RBC's (Liener, 1969). There are indications that lectins reduce the nutritive value of soybean meal for Salmonids but are inactivated by treatment of the meals (Ingh et al, 1991). Other properties: - Soybean is unpalatable for some fishes such as Chinook salmon. While as herbivorous and omnivorous species are less choosy. The size or age of the fish may also affect the palatability of soybean meal. Comprehensive research work has been done to evaluate soybean meals as a replacement of animal protein sources in diets for fishes but the replacement of all fishmeal by soybean meal has not been very successful perhaps due to the limiting amino acids and insufficient heat treatment of the soybean meals. Smith et al (1980) claimed success in feeding rainbow trout a diet based almost entirely on raw materials of vegetable origin containing 80% full fat roasted soybean. In a similar report, Brandt (1979) evaluated a diet based entirely on plant ingredients (containing 50% heated full fat soybean + 10 % maize gluten meal to overcome a possible deficiency of S-amino acids). Reinitz et al (1978) observed that rainbow trout fry fed a diet containing 72.7% full fat soybean had a greater daily increase in length and weight with an improved feed conversion ratio compared with those fed a control diet based on 25% herring meal, 5% fish oil 20% soybean oil meal. The mortality rate for both groups was similar. Taste panel studies indicated that there was no effect of dietary treatment on firmness and flavour of the fish. Kaneko (1969) reported that 1/3rd of white fish meal could be replaced by soybean meal with no negative effects on growth of warm water fishes. Viola (1977) iso-nitrogenously reduced the fishmeal content in the diet of carps containing 25% protein supplemented by soybean meal with the addition of amino acids, vitamins and minerals and opined that soybean diet did not induce good growth in carp. Similarly Atack et al (1979) reported poor utilization of soybean protein by carp when it formed the sole protein source. Gracek (1979) used different qualities of soybean meal to supplement ground maize for feeding carp fry and recorded better survival. No difference in growth was observed when common carp (Cyprinus carpio) were fed either with 45% soybean meal (+10% fishmeal) or 20% soybean meal (+22% fishmeal). Other trails however showed that the growth performance and feed efficiency of common carp were reduced when dietary fish meal was replaced by soybean meals. There were no differences in performance between extruded full fat soybean meal and oil reconstituted soybean meal (Inghet et al; 1991). A better weight gain was reported when soybean meal was incorporated in the diets of carp fish (Cristoma et al; 1984). Similarly sklyrov et al (1985) successfully used soybean meal in rearing carp fish commercially. It is claimed that soybean meal is deficient in available energy and lysine as well as methionine for carps. Supplementation of soybean meal diets with methionine coated with aldehyde treated caesin significantly improved utilisation of amino acid by common carp (Murai et al; 1982). Lack of phosphorus rather than the sulphur amino acids may be the cause for poor performance of common carps when 40% soybean meal diets were fed to them. Addition of 2.0% sodium phosphate did not improve their performances (Viola et al; 1986).Kim and Oh (1985) attributed the poor performance of common carp fed with a diet containing 40% soybean to lack of phosphorus rather than sulphur and amino acids, since addition of 2% sodium phosphates to soybean meal diet improved their performance to a level obtained with the best commercial feed. Nour et al (1989) studied the effect of heat treatment on the nutritive value of soybean meal as complete diet for common carp by autoclaving the soybean seeds for 0, 15, 30, or 90 minutes and recorded maximum average daily weight gain with diets containing soybean seeds autoclaved for 30 minutes. Nandeesha et al (1989) incorporated soybean meal in the diets of Catla and indicated the possibility of utilizing soybean meal in carp diets. Keshavapa et al (1990) used soybean flour in the diet of carp fry and recorded better survival. Senappa (1992) studied protein digestibility from soybean incorporated diets and recorded better digestibility when fed to fingerlings of Catla. Naik (1998) studied the effect of Soya flour and fish meal based diets in the diet of Catla catla & Labeo rohita and observed a better growth and survival of carps when reared together and also in combination with fresh water prawn. Full fat soybean meal heat treated differently replaced fish meal at low levels in diets for channel cat fish showed that replacement gave satisfactory results (Saad, 1979). Growth and feed efficiency of fingerling hybrid tilapia (Oreochromis niloticus) was significantly depressed when soybean meal replaced fish meal at the optimum level (30%) in their diet (Shiau et al, 1988). The growth depression of the hybrid tilapia was reduced when a 30% crude protein diet containing soybean meal but by adding 2-3% dicalcium phosphate to the diet, growth rate of tilapia was comparable to the control (Viola et al, 1986). Soybean meal with supplemental methionine could replace up to 67% fish meal in the diets for milk fish (Chanos chanos) (Shiau et al, 1988). Growth, feed conversion and survival of tiger prawn (Penaeus monodon) juveniles fed two levels of soybean meal under laboratory conditions were lower with higher levels of soybean meal (Piedad, Pascual and Catacutan, 1990). No significant differences in growth and survival could be established when soybean meal at levels from 15- 55% replaced partially or completely fish meal in the diets for tiger prawns stocked in cages in ponds at 10 to 20 shrimps per square meter (Piedad, Pascual et al, 1991). Lim and Dominy(1991) obtained comparable results in feeding Penalus Vannamel with diets containing up to 17% of dry extruded full fat soybean meal as a partial replacement for fish protein. Generally the studies outlined above together with several others indicate that there is an advantage to be gained from using properly processed soybean products for formulating diets for fish due to their better quality protein and higher dietary energy value in full fat soybean which is more advantageous with cold water fish species because warm water fish (Carp, Catfish etc) can utilize carbohydrates more efficiently. The only recommendation relating to the limit of inclusion of full fat soybean in fish diets is not to exceed the known practical limits relating to fats in general in order to avoid problems of feed preparation and to reduce the risk of high fat levels in the meal. Soybean may replace animal protein in diets for aquatic animals to a certain extent. However, with increasing substitution of e.g. fish meal by soybean meal the performance of fish decline. Herbivores may tolerate higher levels of soybean meal than carnivores. It appears that full fat soybean meal is more beneficial for cold water fish than for warm water species due to the better utilization of the energy from the soybean products. Only properly heat treated soybean products should be used for aquatic feeds. Furthermore, it is advisable to use only soybean meals processed from dehulled seeds in order to reduce the crude fisher content in the diet.